100% Heart Certified, These snowflakes will warm your heart! Available for purchase through Amazon, this stunning coloring book celebrates the infinite ways of joining hearts to create the equally infinite range of snowflakes. Lehavi has always marvelled at the diversity in nature. The simple, elegant heart shape is a perfect vehicle to capture this infinite diversity. The book also offers some fun scientific background on snowflakes! 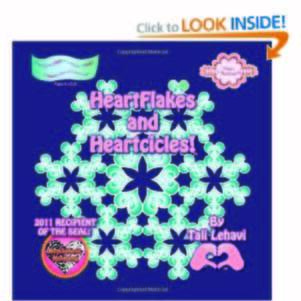 It turns out that snowflakes on Planet Earth and HeartFlakes on Planet Heart have a lot in common!